We love the sauce on our Big Bang Bang Cauliflower Bites so much that we figured we shouldn’t limit it to veggies. Don't be chicken... Try this recipe ASAP! In a wide bowl, use a fork to whisk egg whites/substitute with 1/8 tsp. cayenne pepper. In another wide bowl, mix breadcrumbs with remaining seasonings, including remaining dash of cayenne pepper. Place chicken in the bowl with the egg mixture. Flip to coat. One at a time, shake chicken nuggets to remove excess egg, and coat with breadcrumb mixture. Evenly place on the baking sheet, and top with any remaining breadcrumbs. Bake for 8 minutes. Flip chicken. Bake until slightly browned and crispy, 8 - 10 minutes. Meanwhile, combine sauce ingredients in a small bowl. Mix until smooth and uniform. 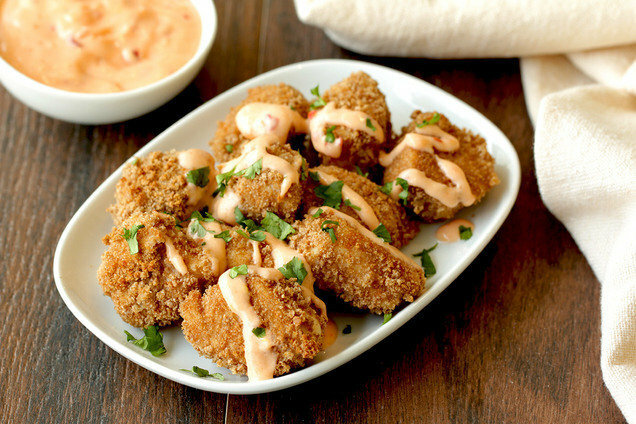 Transfer nuggets to a large plate, and drizzle with half of the sauce. Serve with remaining sauce for dipping. Hungry for More Healthy Finger Foods? This recipe is too good to keep to yourself. Click "Send to a Friend" to share, share, share!